RICHMOND, VA (August 13, 2014) – The 2014-15 ECNL season is dedicated to celebrating the Amazing Young Women that have helped mold this league into the top female youth soccer platform in the world. As part of the campaign, ECNL is encouraging amazing young women to share their stories. Christina Gibbons, an ECNL Alum (CASL), is the first amazing young women sharing her story. 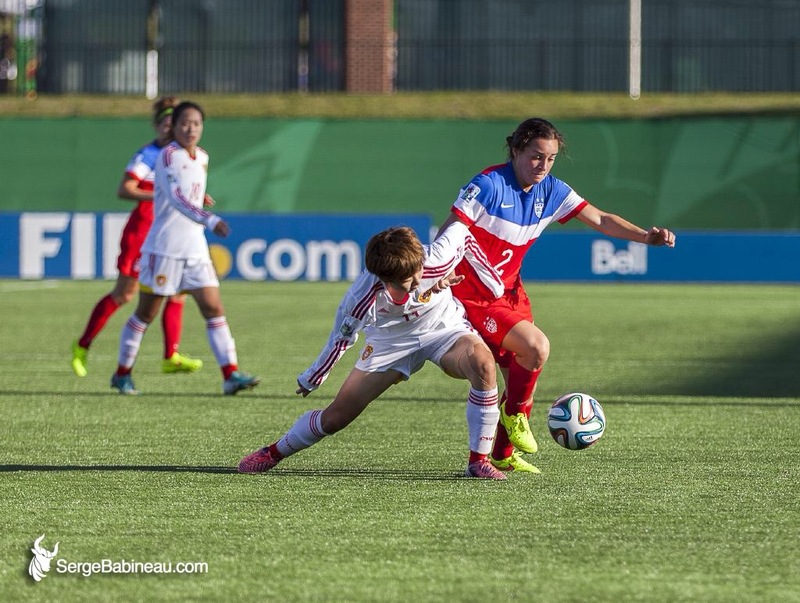 Christina “Gibby” Gibbons is currently a member of the U20 US Women’s National Team (playing in the 2014 U20 FIFA Women’s World Cup), and a sophomore at Duke University. ECNL caught up with Gibby as she prepared for their final group match versus China! Q: Can you fake any accents? If so which one? A: I like to think that my British accent is really really good, but for special occasions I have a Russian accent. Q: If you are first on the bus, what seat do you take? Why? A: I would typically pick a row that is between the middle and back of the bus because I hate not knowing what is going on behind me; that way I can see everything. Always aisle seat if possible, claustrophobia. Q: In five words or less, what was is like to wear the US National Team jersey? Q: Stop, what do you have in your pockets right now? A: Nothing but my hotel room key, I don’t take advantage of pockets as much as I should. Q: If you designed a training session (that you got to play in), it would consist of _________. A: A technical warm up, a small possession drill, and 5v5 to big goals. A: I really enjoy doing impressions, mostly from movies. Q: I, Christina Gibbons am not good at __________. A: Braiding hair. Seriously hardest thing ever. Q: Advice for players looking to play soccer in college? A: My best advice would be to continue to work hard and stay motivated regardless of what happens. A lot of things won’t go exactly how you want them to, but how you respond to those things is most important. Q: Describe your first road trip in your first car. A: The first road trip I really remember was for soccer and I was in the backseat with my parents in the front. We were on our way to Washington DC, I got car sick, we had to pull over on the side, and lets just say it wasn’t the smoothest of rides. A: Otto from Rocket Power just because he was awesome. A: Sometimes claustrophobia, but I also have a huge phobia of crumbs. I hate crumbs. Q: What is your pre-game superstition? A: My socks have to be folded perfectly or else everything is just off. Q: Current #1 most played song on your iTunes? Q: My longest streak without a shower is ___________. A: Maybe 24 hours, however that hasn’t happened in years. I love feeling clean. Q: Favorite city you visited for ECNL? Q: Who would you call your Soccer Idol (besides Skate)? A: This is tough question. It’s not necessarily one person but recently with Carla Overbeck as one of my assistant coaches at Duke, I’ve learned so much from her as a player and a person. Q: If you could choose to be any animal, what would it be? A: A dog, they’re the best! Q: If you could choose to be any person for a day, alive or deceased, who would it be? A: I would love to be one of my ancestors to see where I come from and how they lived. A: Backstreet Boys – they killed it. Q: Best advice you ever received or favorite quote? A: My club coach who said this to me before I left for college, “Be hungry, but stay humble.” I loved it because I feel like it describes my mentality and it is awesome advice. Q: ECNL prepared me for ___________. The Elite Clubs National League, Inc. (ECNL) is a 501(c) (3) non-profit member-based organization founded in 2009 to enhance the developmental experience of female youth soccer players in the United States. ECNL’s mission is to improve the competitive environment through creation of a true national competitive league, to improve the process for identifying elite female soccer players for the U.S. Soccer youth national teams, and to improve the daily training environment at top female youth soccer clubs through the development of best practices for its member clubs. The ECNL is sponsored by Nike. The National Guard is the official military branch of the ECNL. For more information, please visit http://www.eliteclubsnationalleague.com or follow ECNL on Twitter, @theECNL.